For frequent readers of Cue Sport Nation you are already familiar with "Team London." 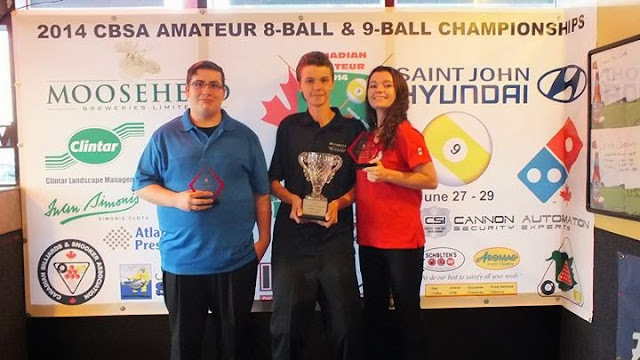 These are the three junior players who earned the right to represent Canada at the World Junior Championships November 15-18 by winning their spots at this years Canadian Championships. Stuart Mactaggart 17 , Nicholas Ridley 15, and Kayla Roloson 17, were all guaranteed spots at the World Championships however they had to find away to get themselves all the way to China in order to take advantage of this opportunity. Thus they banded together this summer and formed a fundraising organization named "Team London". They were off to a great start as they were able to get a segment on their local CTV London news station to help kick off the fundraiser on gofundme.com. I remember checking their progress online about a month into their campaign in mid August and feeling concerned as only $360 had been raised to date. With the Tailgators Summer Shootout coming up at the time we at Cue Sport Nation wanted to figure out a way that we could help. Thankfully my homeroom of Rack-M-Up Billiards donated a cue and Steve Gelinas from the Winning Stroke donated a Delta Rack which we raffled off. The $260 we raised was barely a fraction of the $7,000 needed for the trip but we sent the money in with the hopes that people would come together and do the right thing. To my surprise and joy, people did more than step up as Team London in the last few months have raised $10,000, a whopping $3000 more than the initial goal. To be used for a nice meal for the kids and their parents/chaperones in Shanghai and whats left to be donated back to a Junior Fund. It should also be mentioned that the Canadian Billiard and Snooker Association stepped up here in a big way. With the help of OB Cues, one of their sponsors, they were able to donate a cue which was raffled off and also gave $500 to each of the team members to help with expenses. Check back in with Cue Sport Nation later this week for updates on their progress. They leave tomorrow and the tournament starts on the 15th; we will have updates posted as soon as we get them. On behalf of Team London I would like to thank and congratulate all who helped in raising the money necessary for this trip to be possible. Also as Cue Sport Nation gains more advertising support and becomes viable as a business, we plan on giving back as much as we can in these situations in the future. Amatuer Results from "Shooters Bar & Billards"
Sumon Sarkar Undefeated in 2nd RCC Event!